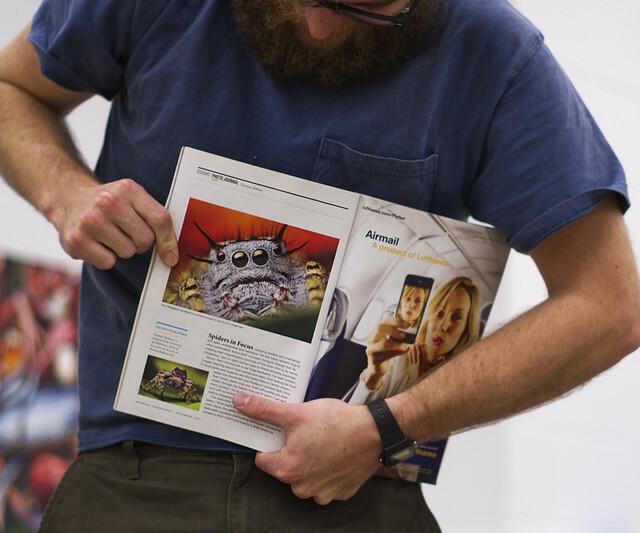 Meet Thomas Shahan: Art student, arthropod aficionado, and Flickr member since 2007. After a year since first contact with National Geographic Magazine, Thomas has his work featured in this month’s issue. We want to congratulate him and thought you might be interested in knowing a bit more about how the article shown in the photo above came to be and how his work and his passion for arthropod macro photography came to be. Thomas tells us that he never really considered himself a photographer, as his macrophotography work to date has just been a hobby of his. He began noticing how beautiful jumping spiders around his home in Oklahoma were when he was in late high school, experimenting with reversed lenses and macro-bellows. This was the trigger to flourish his interests with macrophotography and arthropods throughout his past few years in college. The first two years or so, he says, were a time of largely just experimenting with different homemade equipment, extension tubes, flash bouncers, diffusers and other equipment. Thomas began taking photographs of easily attainable household objects to get his feet wet in macrophotography: Pennies, the balls on ball-point pens, circuit boards, … but soon he became bored: "Nothing quenched my curiosity to see things up close. They posed no challenge, unrewarding details, no thrill-of-the-chase, and most of all – no life." 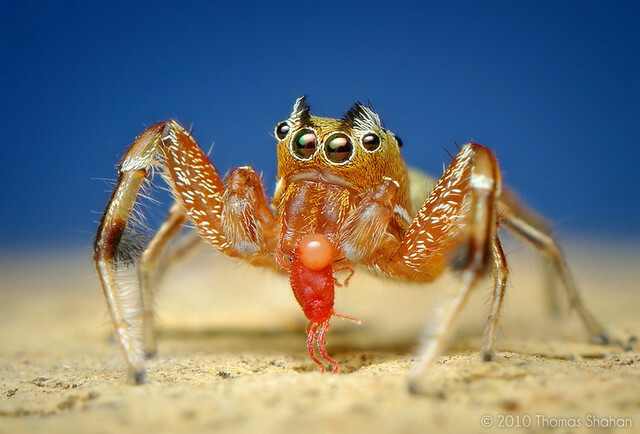 Around this time, Thomas began noticing large jumping spiders in his backyard. 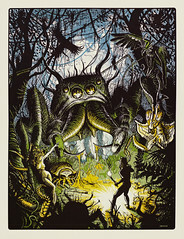 "They had huge, beautiful glossy eyes that seemed to follow my every move with an intelligence and sentience that completely enchanted me in a way that altered my entire outlook on arthropods, photography, and more. 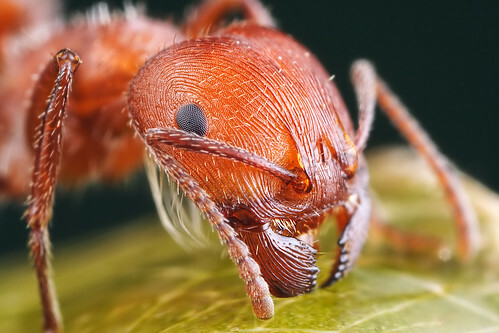 True beauty lies within nature – no manmade object is as truly rewarding at high-magnification as arthropods. " While Thomas has no formal background in Arthropodology, he tells me that he is quite interested in this field and has become fairly well versed in the world of arthropods in the last few years. Through his work with macrophotography, and the large amount of time spent studying and working with arthropods, his familiarity with taxonomic names, arthropod behavior, and general morphology has grown considerably – in short – Thomas is very familiar and comfortable with the subjects. "Achieving focus is a tough combination of gut instinct, estimation, and narrowing highlights into the smallest points of light possible." Thomas knowledge about his photographic subjects is paired with gear that helps him achieve the stunning results you see throughout this article: "I’m currently using a Pentax K-x body, a set of extension tubes, and either a vintage 50mm f/1.7, or 28mm prime lens reversed to the end of the tubes. For lighting, I have an old Vivitar Thyristor flash mounted to a flash bracket diffused with a homemade softbox constructed from cardboard, tinfoil, and paper towel. In the past, I’ve used a Pentax K200D body, and before that – a Pentax *ist DL. I’ve stood by Pentax as their bodies work with just about any lens they’ve produced, even back through the film era – meaning as a frugal guy, I could easily attain high quality glass for cheap." Given that Thomas works a lot with reversed lenses, I was curious if he uses a special filter or other means to protect them. But this isn’t a big concern of him: "I’m not the guy to ask about protecting lenses – I’m using 20 dollar lenses that are significantly scratched after years of tumbling around in my backpack without proper caps. I usually keep spare lenses in socks. My 28mm, a garage-sale find, is almost solely mounted backwards and never used as it was intended. I admittedly take very poor care of my equipment." Asked if he uses any equipment that he would call "out of the norm", "DIY", or "repurposed", Thomas explains that "Reverse-lens macrophotography is a pretty odd way to go – but offers a lot of magnification for cheap." As a result of using cheap no-name extension tubes, a reversal ring, and old manual focus film-era prime lenses – he has to set everything manually. Additionally, Thomas needs to stop down the lenses to quite small apertures of f/11 or f/16 to get any depth of field at all at such high magnifications. This is a true challenge, as it effectively darkens the viewfinder considerably, and Thomas often has to focus through an almost pure black viewfinder: "I usually achieve focus by a combination of gut instinct, estimation, and narrowing highlights into the smallest points of light possible. It’s tough." Thomas also calls his homemade flash diffuser "a bit of an odd bit". It is crafted from a used Goldfish cracker box cut down and lined with tinfoil. The front element is a sheet of paper towel sandwiched between two clear pieces of plastic from a pretzel tub. "Apparently I consume a lot of snacks. ", he adds. A clip showcasing more of his process and work over at YouTube. 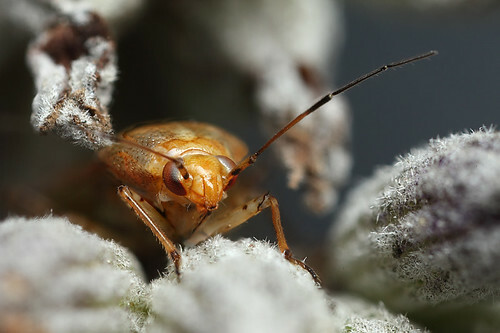 Finally, Thomas is happy to reveal his "secret ingredient" for anthropod macrophotography: "Perfect focus on the eyes! Another requirement is a nice balance of value contrast and color contrast. Of course there are different aesthetic and stylistic reasons for not doing so – but I always like having light subjects on darker background and darker subjects on lighter backgrounds. Also, as an art student, a utilization of complimentary colors and certain color palettes comes a bit more naturally. I always try to use objects and foliage from the subject’s environment as well to find flattering backgrounds that enhance the subject’s beauty." 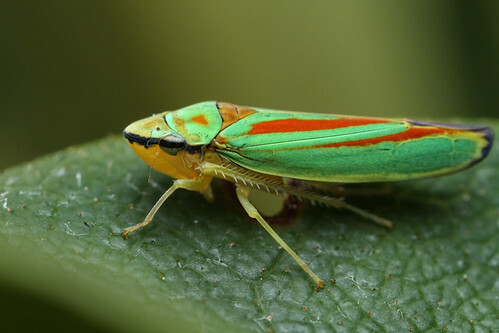 "Also, most importantly of all – I only photograph live, healthy bugs. Sure, it can be an absolute pain to miss focus on one 4mm spider outside in heavy winds for 4 hours, but once you get that perfect shot, it’s all worthwhile." "When I first started posting my arthropod photos to Flickr, Mundo Poco and Lord V were two big inspirations in regards to equipment and a level of detail to accomplish. They are both excellent photographers with a wonderful eye for subjects and composition." You can also check out Thomas favorites to see other amazing insect and space photos. Thomas reveals that the editors of National Geographic discovered him about a year ago, although he is not entirely sure how: "I was contacted by the magazine and they were interested in my processing techniques and methods of focus stacking. I think they might have been a bit suspicious of the authenticity of the images as I admittedly do have pretty bright, garish colors and contrast sometimes. But that’s the nature of arthropods – they are flamboyant, wildly colorful animals – and I selectively choose the most attractive specimens. That said, I am quite careful to not bleach out fine details or oversaturate natural colors. 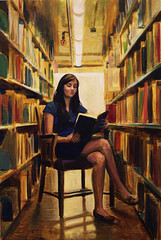 I would never physically alter or fabricate any detail or color within a subject. This inclusion in National Geographic in a way kind of proves the authenticity of the images, as I had to go through a fairly lengthy process of providing examples of my process to prove their honesty. I know NGM wouldn’t choose over-processed images that were overtly digitally manipulated in a way that drastically altered the appearance of these spiders." 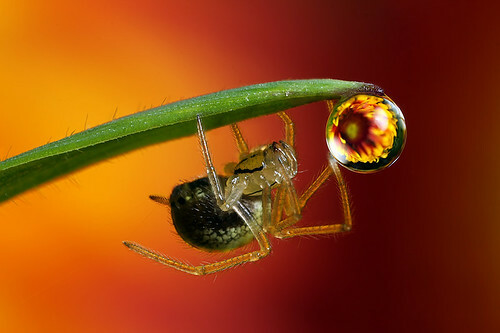 The result is the article “Spiders in Focus” that has been published in the December 2011 issue of National Geographic Magazine and on their website. 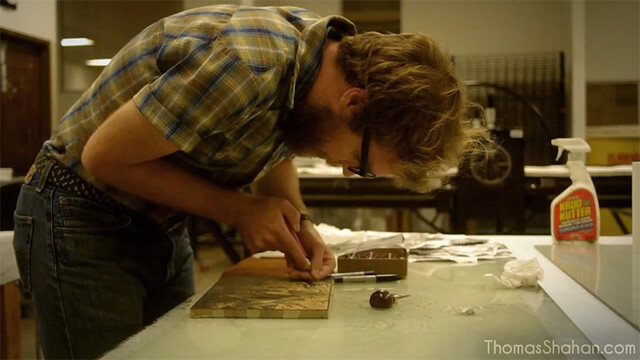 Thomas is currently about to graduate as an art student with an emphasis in traditional printmaking. You can find more of his artwork in his other Flickr account, and further endeavors on his website ThomasShahan.com. Thomas, thank you very much for the interview. Photos from Thomas Shahan, Mundo Poco, Lord V and Thomas Shahan 2.